Apple’s recently-announced iPad has received quite a mixed reaction from both the media and the public. The moment it was announced, the Internet exploded with questions and criticisms concerning the highly-anticipated device. I recall listening to a tech podcast over a year ago in which all but one of the analysts agreed that the one device they wish Apple would release was a much larger iPhone-like device with “around a 10-inch screen.” Well, that’s almost exactly what the iPad is, which is one of the heaviest criticisms against it. It’s crazy how fickle tech critics can be. One of the main questions asked about the iPad is, “Who is its audience?” What kind of people are going to buy this thing? Everyone needs a phone, so the iPhone fulfills that need. Most people need a computer, so a MacBook or iMac can fulfill that need. What needs are there that are met by the iPad? Well, I’m about to tell you the group of people that I believe will pick up the iPad and make it something of a standard in their ranks: MINISTERS. Most ministers are zealous readers, amassing libraries that are, quite frankly, beyond ridiculous. They don’t just read the Bible; they read leadership books, Bible studies, nonfiction, biographies, and more. They’re constantly searching for inspiration, metaphors, and stories. Part of their job is to inspire and educate, and these tasks are far more difficult if they’re not well-read. We have known that e-books are going to be a part of our future; we just don’t know when they’ll be mainstream. I believe the iPad will play a large role in bringing e-books to the masses. MP3s were around for years before the iPod and iTunes Store, but Apple’s device and the user experience that came with it brought the little white earbuds to the masses. At last count, over 220,000,000 iPods have been sold, and digital music has become the modern standard. iBooks have the potential to bridge the gap between tech enthusiast and mainstream consumer. All a minister has to do to get excited about the iPad is imagine taking that entire collection of books, and placing them all within one small device, only a few taps and swipes away. Twenty years ago, the idea of carrying around our entire music library on a device that fit within our pocket seemed far-fetched and less than romantic. Today, because of the iPod, digital music is quickly become the standard way to enjoy music. The iPad has the potential to do for digital books what the iPod (and iTunes) did for digital music. Sure, I’ll have to buy the digital versions and build my iBook library from scratch, but revolutions are always accompanied by sacrifice. I have hundreds of books, most of them at my home, and many will never again be cracked open. I plan on selling all the books that I won’t read a second time or don’t have sentimental value in order to help buy an iPad. Consider that you will likely be able to buy iBooks at a better price than at a bookstore, and it helps soften the blow. I personally speak on Wednesday nights from my MacBook. I take it with me to the podium, and I’m positive the students understand that it’s not a pretentious move. I avoid that route when speaking in front adults or while out of town, as I think that’s the safest bet. With the iPad, I can take all of my messages with me, speak from the iPad, and the crowd will most likely not have a clue that I’m using a high tech device to read my notes. This will be as easy of a transition as I could expect because I already use Pages for all of my word processing needs. I don’t even have Microsoft Office on my MacBook. But even if you’re a Word-addicted PC user, Pages is still able to read your .doc files, so you can export your documents to the iPad and read/edit them in Pages while on the go. I don’t plan on typing up entire messages on the touchscreen keyboard, but I certainly plan on using Pages to edit and view my messages, even while I’m speaking in front of people. This particular category is not specific to ministers; everyone who doesn’t have view the world through Apple-hating sunglasses will likely get excited about the applications that will debut for the iPad within the coming months. Apple has increasingly come under fire for the closed nature of its App Store, which has, just as Apple insisted, ensured a quality and consistency to iPhone applications. Yes, some of their rejections seem unfair (Google Voice quickly comes to mind), but that’s Apple’s prerogative. If you don’t like it, vote with your wallet. Buy an Android and enjoy a laggy experience, or buy a Blackberry and fight an antiquated operating system. The launch of the App Store has been an undeniable success story. Some applications have become must-haves in my life. I recently blogged about the YouVersion Bible app, but I use other apps on a nearly daily basis, including Tweetie, The Weather Channel, Facebook, AroundMe, Engadget, and *cough* Peggle. 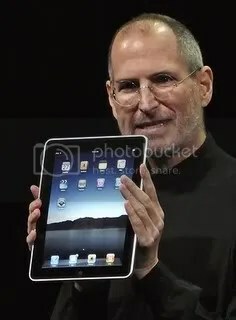 The iPad has been ridiculed for basically stretching iPhone apps across its screen in a jaggy, pixelated fashion, but those critics who mock this point are neglecting to remind people that the iPad will soon have thousands of applications built from the ground up specifically for the iPad. These apps will take advantage of the iPad’s large screen, opening up a world of possibilities. YouVersion is already a fantastic mobile app, but imagine what they’ll be able to do with all of that extra real estate! I’m looking forward to seeing what outside developers will manage to come up with for the iPad. I won’t buy one immediately after it’s released, but that’s because I plan on saving up, selling unwanted items, and paying for it in cash rather than putting a cent on credit card. I don’t know if that will be in March or in November, but I’m definitely excited about this device that the media is so adamant about destroying. Oh, and to the Amazon Kindle and Barnes & Noble Nook…I’m deeply sorry. It’s been a while since I last posted anything to my blog. Due to the uprise of Twitter (which I’ll be posting a surprising piece about one of these days), I’ve done most of my link-sharing and minimalistic observations through Twitter, which auto-posts to Facebook. Why post a 500-word blog about AT&T when I can just tweet “I really hate AT&T’s so-called best 3G network,” and be done with it? But now that I’ve decided to come back, I have but one thing to address: YouVersion. I had previously been a devotee of BibleGateway for no other reason that it was familiar. Now I’m a YouVersion addict, and not just on my computer. Being a two-year-long iPhone user, I’ve had YouVersion’s Bible app for a long time. Are you an iPhone hater, or don’t want to deal with AT&T? No problem; you can use YouVersion with your BlackBerry, Android, or Palm Pre. You can also use the mobile web version. Just check out their Mobile page for details. The beauty of it: it’s free. I highly recommend signing up for an account and making use of YouVersion’s multiple reading plans. Use bookmarks. Use the various translations to their fullest. It’s my favorite Bible site and my favorite Bible app (even if it does require a wireless connection to use it – mobile or WiFi). Download it today. Small point here, but relevant. With the iPhone app, you can download all or specific versions of the Bible to read/browse while offline. It’s in the settings of the very awesomistic app!